"The 3D image of my son Joaquin is the most powerful statement that this movement has ever had," says Manuel Oliver, cofounder of Change the Ref. When Alma approached Manuel Oliver, father of 17-year-old Joaquin, who was killed in the Parkland school shooting last February, about turning his son into a 3D printed activist, he thought the agency was crazy. "How is this possible? And how will I react to all this? There is no way to replace a person that has been murdered, and the simple idea of making this 3D image of my son erupted in me mixed feelings of sadness and rage," he told Campaign U.S. "The tipping point, and what changed my mind, making me think as an activist, not only as a father, was the power behind the idea." 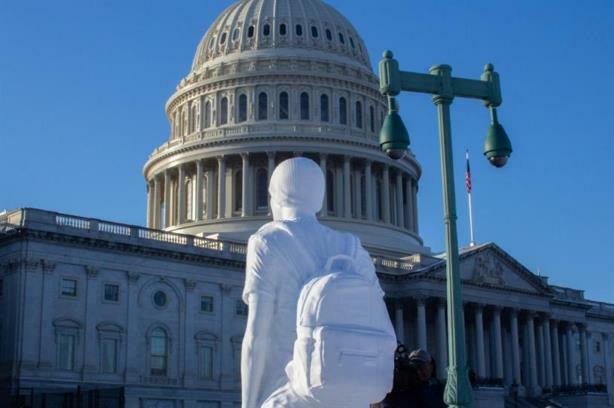 Alma, in partnership with nonprofit Change the Ref, which seeks to empower youth to use creativity and urban art to fight for change, created the 3D activist replica of Joaquin in response to the lawful online distribution of 3D gun blueprints. The 3D activist travels from New York to South Africa to the steps of Congress in Washington, D.C., to fight for gun laws. Manuel Oliver, who cofounded Change the Ref with his wife, Patricia, said the power of this idea when it comes to gun violence activism is "unlimited." "The 3D image of my son, Joaquin, is the most powerful statement that this movement has ever had," he said. "In this case, a victim is turned into an activist, and that actually is a big emotional step for all the people involved in the cause. The goal is to keep him active and make sure that his presence empowers any actions that can fight gun violence and the gun lobby." While Joaquin’s replica has already attended venues and rallies, his work is not done. The 3D activist – and Manuel Oliver - will take center stage at the Cannes Lions International Festival of Creativity in June. Alma also created a documentary that follows Joaquin’s statue as he goes from victim to activist. "Our idea with the documentary was not only to create awareness about the abhorrent gun laws in the U.S., but to go above and beyond the call of our advertising duty by creating an activist that was beyond unstoppable -- eternal," the agency told Campaign, "the first activist whose ideals could transcend him being a victim and stand forever in the struggle for gun reform."